I am not a big fan of the cold winters here in Michigan, but the fun things you can do with dormant shrubs makes it some better. When all my summer annuals and fall mums need to go away, that leaves me with the opportunity to refill my planters for winter. Obviously plants are not going to work for me in Michigan so I have to think outside the box. I start to look at my shrubs and perennials and see what can be used in containers. 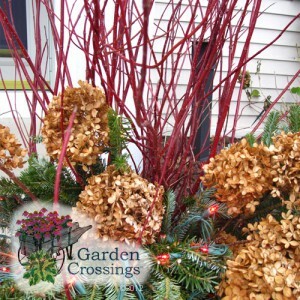 For this combination I choose to use Red Twig Dogwood – Arctic Fire™ Cornus, the dried flowers of Hydrangea ‘LimeLight’, and branches off my Christmas Tree. I arranged them in a planter and added a few red lights to highlight the red twigs at night. 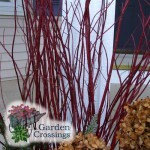 I am really impressed by the intensity that the Red Twig Dogwood gives, the color is so bold and really stands out against the white trim of my house. I can not wait ( I say this lightly) for the snow, the contrast will be stunning.